Eden Struss is a renowned wardrobe stylist and apparel designer. Shortly after attending the Laguna College of Art and Design, she launched Eden Basics one of the first women-specific snow outerwear brands in the country. Eden’s entrepreneurial spirit and pursuit of passion is inspiring! We interviewed her about her business, Styling by Eden and what brings her bliss. Q: What motivated you to start your business, Styling By Eden? Raised in Los Angeles County, I was exposed at a very young age to the world of styling by my mother. With my mother’s influence as a wardrobe stylist, casting director, and set designer, I developed a very strong passion for the behind the scenes glamour of the fashion industry. After being such a heavy hitter in the corporate world of marketing and design, I decided it was time to get a little more personal and work one on one with people to help them feel good about themselves. I love to see the curiosity and excitement in people after I’ve given them my image consulting services. There is nothing more satisfying than watching someone transform for the better right in front of your eyes. To know you have something to do with making their day better is what makes my heart tick now a days. Q: What are three things that give you Bliss? The three things that give me bliss are making a difference in peoples lives, seeing a transformation in someone through my help, and of course traveling! Q: What is Styling for A Cause and why is it so important to you? I’m a single mom. This extremely hard challenge pulled on my heart to start a ministry called STYLING FOR A CAUSE. 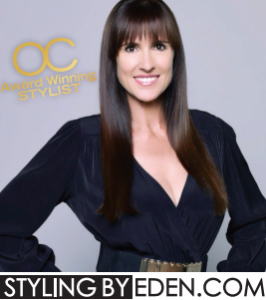 A portion of my proceeds from STYLING BY EDEN help single mothers find the emotional self confidence they need to become financially independent and fulfilled. There is nothing harder than feeling alone when you’re raising a child. I want to help other mothers know they’re not alone in this journey called motherhood and truly show them there is a specific reason for their task in life as a mother and most importantly for their child. Sometimes it can be as simple as taking a moment out of our busy lives to believe in another person. This can change a life forever. If you would like to learn more aboutStyling For A Cause, how to get involved, or donate, contact Eden. Q: You’re certainly a swell woman, what message would you give to other SwellWomen? The advice I would give to other swell women is to never give up on your dreams. Let your faith be bigger than your fear and always know you can accomplish anything you set your heart and mind to.